How office space influences employee behavior. Is it possible that office space can influence behaviors that drive innovation? Staying at the front with new ideas, products, and services is one of today’s key dynamics to create a sustainable business model. Businesses need talented and engaged employees that can help drive that innovation. 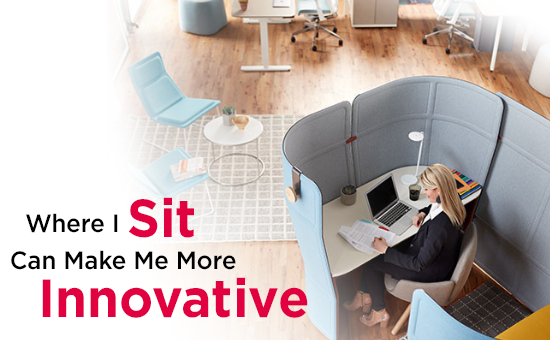 I believe that the workspace can either support or hinder an employee’s ability to innovate. Let’s first recognize that creativity and innovation are not the same, and researchers identify these as two separate concepts that work together. Creativity is the process of coming up with new and different ideas. Innovation is the discovery of those new ideas that result in production or economic usefulness. Innovation comes from using what we already know, then sharing with others and determining together if the idea is valuable or useful to the business or market. The critical last step is sharing these ideas, evaluating their successes and failures and incorporating this back into the knowledge stream to move the next evolution of ideas forward. Every day our brains are responding to stimuli in the environment—and office spaces are no different. These stimuli influence our behaviors, as well as our ability to create and innovate. It’s important to know that each of us responds to environmental stimulus differently based on our experiences, interests, and our ability to focus. For example, some people are more bothered by an open office plan than others. Some need to go to a quiet library instead of a buzzing local café to do their best, head-down work. A lot of us need both of these spaces and experiences at different points during the day. Focus is critical to the various stages of creative thinking and innovation—it allows us to problem solve, learn, and evaluate. At the same time, taking a break is critical to the creative process. This is called divergent thinking and it provides restoration for the mind, allowing us to generate new ideas. Restoration can vary, from looking up for a few minutes to socializing with friends at the end of the day. Routine activities such as gardening and walking also allow the brain to be restored and give our minds a chance to downgrade and default into imagination. Our workspaces matter. They allow us to support employees in doing their best work, whether that’s creative thinking or producing innovative ideas. These spaces need to support employees’ abilities to do both focus work and divergent thinking. For some, focused spaces may need to be quiet with no distractions. These spaces may be out of the main traffic flow and have some visual partitioning. For others, spaces can have general background noise like the activity at a Starbucks. Spaces for the mind to rest can be as simple as providing access to daylight and views so people can look out at the horizon. Social areas such as cafés, outdoor areas, and strategically placed gathering spaces with lounge seating easily support divergent thinking opportunities. This isn’t revolutionary thinking, but we need to be thoughtful as we design these spaces. The designs of yesterday—where everyone sat in the exact same cubical and had formal conference rooms as the only place to share information—simply don’t meet the needs for the whole brain or allow it to do its best work. We need to provide a variety of different spaces. Everything from one- to two- to four-person (or more) gathering areas, to break areas, café areas, as well as individual workstations, should be available to be used for different purposes by individuals. Space impacts innovation. The design of these work environments should not be one-size-fits-all. As I mentioned earlier, innovation comes from using what we already know, then sharing with others. By providing a variety of spaces that can be used throughout the day for both focused work and sharing with others, spaces can support human behavior and, in turn, organizations can design for their success. Contact your Wittigs representative to find seating solutions for your workspace challenges. Lynn Metz, LEED AP, is a registered interior designer and Vice President of Sales, Architecture, and Design, for Haworth North America. With her expertise in space design and demonstrated history of working in the furniture industry, she engages in the understanding of human behavior and realizes the importance and impact it has for a successfully designed environment. As a member of Forbes Business Development Council, she is a contributing writer to Forbes CommunityVoice™, a digital publishing platform that connects experts directly with the Forbes audience by enabling them to create content and participate in the conversation. Read more from Lynn.